The space on the south side of our backyard is heavily shaded, which is to the left of the photo below. 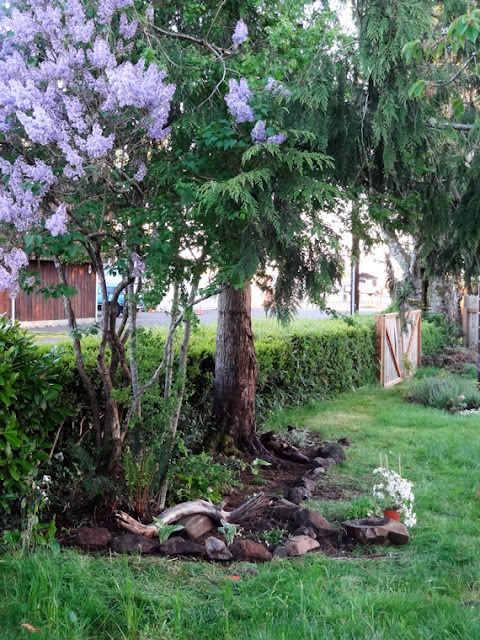 With cover from our cedar, lilac and mystery trees plus the large boxwood and laurel hedges - it's no surprise. We've done little in this area and have let things pretty much grow wild which means that the pesky bamboo was taking over and it looked awful. A Before photo from back in September before the out of control growth! 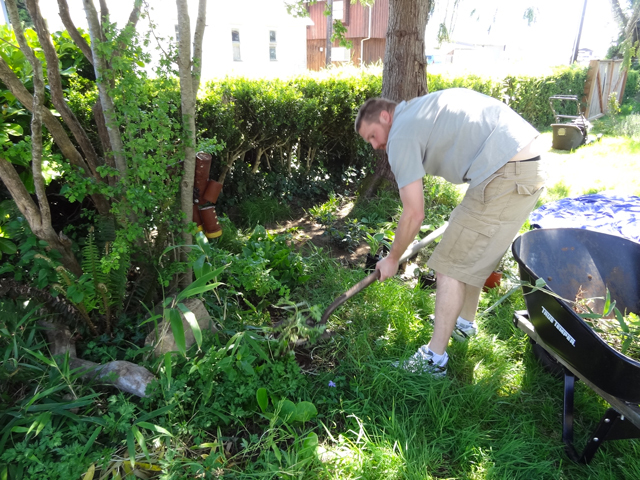 I put the hubs back to work digging out the bamboo. 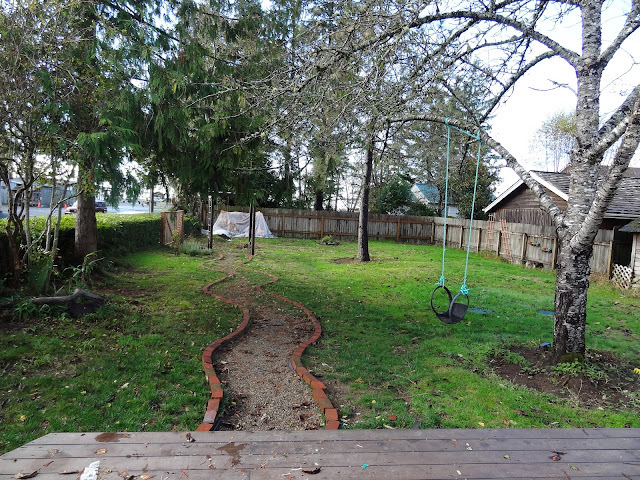 He did a pretty stellar job of removing a few large growths of it in the far back of the yard and around the large trees. For any of you that have had to deal with an infestation of bamboo, you know that it is one of the hardest plants to remove. While beautiful and ornamental when used in landscaping design, bamboo can also be an incredible nuisance. It can grow a foot or two in a day and can take years to fully remove. Our method of removal is to dig up the root system, which seems to have worked so far. It involves a great deal of muscle - hence the use of the husband. Check out these other methods of bamboo removal which range from frequent mowing to herbicides. 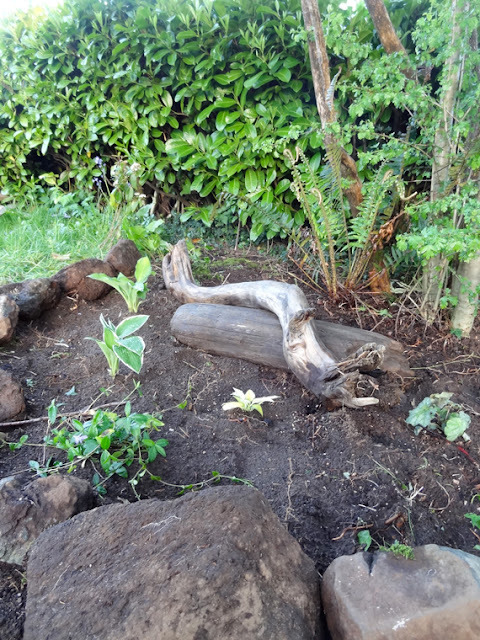 Josh made quick work of removing the bamboo and before long we had a nice clear space, ready for plants. 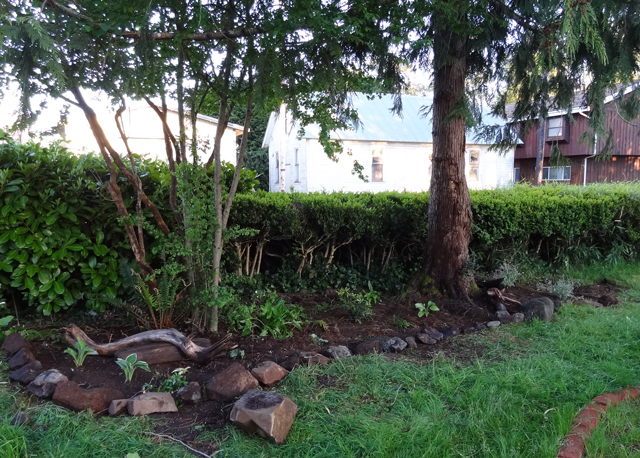 I used river rocks that had either been buried in this bed or from other areas of the yard to edge the garden bed. I really like the natural look of the river rocks and plan to one day replace the brick that lines our pathway with them. I'm not too fond of the harsh red color of the brick and would rather have a more neutral and natural option, like river rocks. The shade garden contains hostas, ferns, creeping myrtle, a shade-loving shrub, and a few flowering plants. I'd love to add a few hellebores for architectural appeal as well as a few more flowering plants to add some height and depth to the space and, of course, more hostas and ferns. I love the clustered and full look of garden beds and I was inspired by the shade gardens here, here and here. Like I said before, there's still lots to do and more plants to plant until this space is fully finished. It looks so sparse right now - while the plants are still young. I can't wait to see them when they're more fully developed. I still need to spread some mulch down in this bed to keep the weeds at bay and keep our moisture levels on track - our sandy soil is not really the best for growing so I may have to mix in some more garden soil before I spread the mulch. I also need to borrow Josh's muscles again to move the hunk of rock in the foreground. So what are your go to shade plants? Have any tips for this newbie gardener?